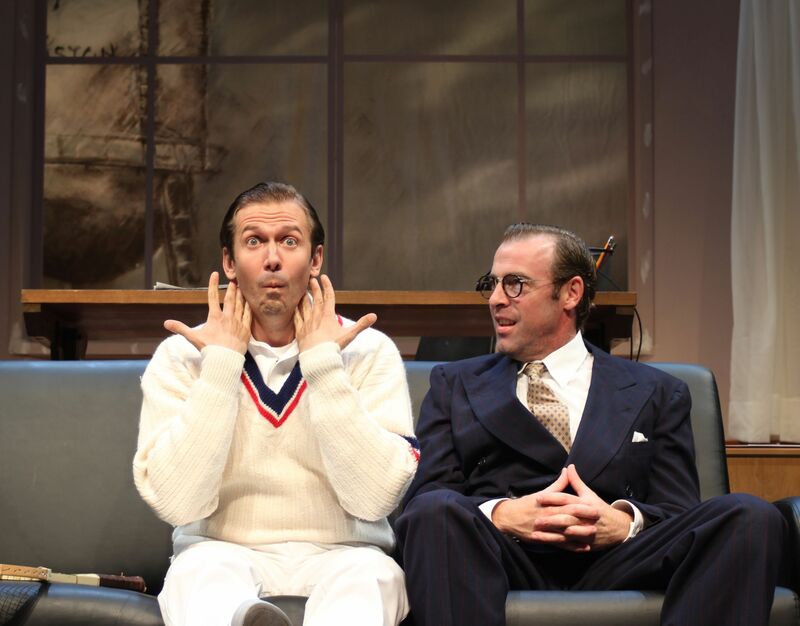 Shawn Fagan and Ian Merrill Peakes in Gulfshore Playhouse’s production of “Something Intangible”. Howdy. I’m writing from my lovely little screened-in patio in the Sharondale Apartments, the sound of the wind in the trees almost masking the traffic noise from Immokalee, and I’m thinking of three things in response to Cody’s request that I write something about the theatre: team, family, and home. These are the topics most in my thoughts when I’m out on the road, making a play, trying to organize my life in unfamiliar circumstances. And while I hadn’t thought of it before the heaping dish of nerd-cake served up here this week, the Harry Potter series has a lot to say about all three. First, team. At it’s most basic a team is just a group of people with a common goal: beating the Yankees, getting a show to opening, defeating Voldemort. I think this is one of the main reasons I got into the theatre. I have an opportunity, with every new project, to be a part of a great team, and also to help build that team. Because it isn’t automatic. Whether consciously or unconsciously, the members of a team have to build it, from the inside. It doesn’t always happen, and a goal can be accomplished by a mediocre team, for sure, but it’s so much more satisfying, and so much more can be achieved, when everyone involved is investing some energy into team-building. J.K Rowling seems obsessed with team building. 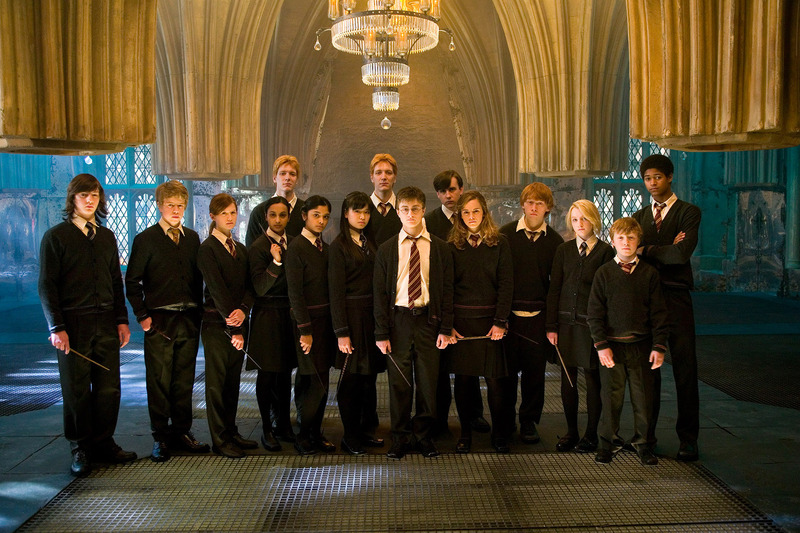 Ron and Harry and Hermione coming together to solve a mystery, Dumbledore orchestrating things to put the right people together at the right time, the students self-organizing to form Dumbledore’s Army: all examples of team building at work. As readers we love these kinds of stories, I think because humans are such social animals. We’re meant to work cooperatively. We like to do it and we like to have that desire reinforced in stories. I think I’ve stuck with the theatre because it gives me a chance to engage with this fundamental instinct over and over again. Next, family. This is a thornier idea, as the word can mean different things to different people, but I’ve always thought of family as the people in my life that I’m in relation to for better or worse, which I think has something to do with recognizing another person’s needs as equal to or greater than one’s own needs. The theatre also offers plenty of opportunities for family-building (and I do think that family is something that has to be created, not something as unconsidered as blood relation), though it’s rarer and less concrete than the team stuff. Here’s an example. Cody and I worked on a project together a couple years ago, and it was a massive undertaking. I had a lot of heavy lifting to do in the play, which was daunting and thrilling, and once we got into the dressing room, Cody’s spot was next to mine, and there wasn’t a day that went by that he didn’t check in, ask me how I was doing, if I needed anything. That’s family-level human interaction, and it transcends teamwork. The theatre gives us opportunities to relate that way. And it’s precious. The Harry Potter story is obviously about family, and especially how family can be created. Harry shows up at Hogwarts thinking his only real family is his blood family, people that don’t understand him or care about him, and in the course of his adventures learns what his family really is: a web of mutual care and sacrifice. Making a play is always an opportunity to add to one’s family and to learn what it means to be a good family member. Lastly, home. I’m not really sure what to say about this, but it’s been so dominant in my thoughts lately, and seems so clearly related to team and family, that I included it. Also my high school composition teacher always said arguments depend on threes (which is true of jokes too, by the way), so here it is. I miss my fiancé and our dog and cat, and I miss our apartment, and my friends. I miss home. But in some way, working in theatre I’m always home: making coffee in a strange apartment in the morning, rehearsing a bit over and over until it’s just so, breathing in the moment right before walking out on stage. Those have all come to feel like home. So there’s that. I don’t know what it means. Both things are true simultaneously: I’m home here and I’m homesick here. Maybe it’s a little like Harry and his parents: They’re dead and gone and they’re always with him, both are true simultaneously. Maybe the main project is learning how to let both things be true, even if it seems impossible for them to coexist. Who knows?